As in most Catholic families as far as I know, Christmas Eve is the big night in our house. Growing up, we would sometimes have 15 to 20 people over for Christmas Eve dinner. My mom did all the cooking and when my brothers and I were young, we got to open almost all of our presents on that night too. Christmas morning was reserved for the presents that Santa brought. It's still the night that my family celebrates with a big dinner. When my mom was alive she did the cooking and it was always traditional Italian fare: stuffed manicotti or shells, baked ziti, breaded chicken cutlets, and always an assortment of beautiful homemade cookies and desserts. Now that I am the cook, I still make something Italian. One year I did baccalà (it was a disaster, but some day I'll try again), and last year I did a Sicilian pork roast with olives and grapes. But the family's favorite is probably my Cioppino. In the South of Italy it is traditional to eat the "Feast of Seven Fishes" on Christmas Eve -- usually seven courses all with a different seafood ingredient representing the seven holy sacraments. 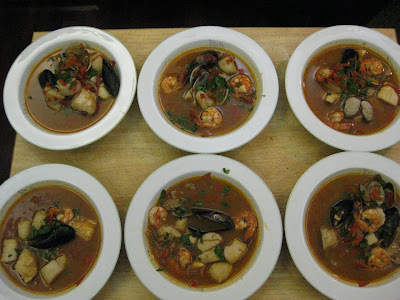 I have not been that ambitious (yet) so I make a seafood stew and throw all seven (almost) fishes into the pot. This year it was shrimp, scallops, mussels, halibut and clams. My recipe is from Michael Mina and the best part is this little spicy basil oil that gets drizzled on at the end before serving. It's also nice to bake some large crostini with garlic and olive oil to serve alongside the soup. And this year, we had my brother's slow-roasted Heritage Farm pork as a second course with the most delicious orange-glazed sweet potatoes. It was one of our best Christmas Eve dinners to date. It was fun to cook together with my bro this year. I hope that's a tradition that continues. 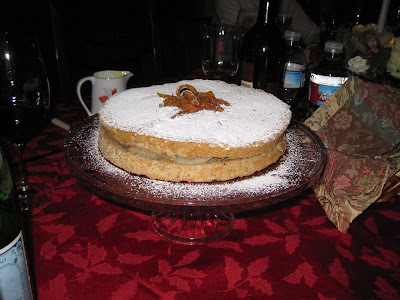 And, for dessert, I made the special almond-orange cake with pears and creme anglaise pictured above. It was the perfect ending to a wonderful meal. Our family chose not to do gifts this year and there was something really refreshing and simple about that. Everything then revolves around the food, which is fine with me! To cook together and eat together as a family was the best gift we could get. As I said in the last post, this is the year for making homemade gifts. Some people have always made fruitcakes (which I happen to love). My family always made Italian "pizzelles" (white snowflake-like cookies made with a kind of waffle iron) and my mom's sugar cookies were the favorite gift of all of my friends. My Aunt Kate made the best toffee and peanut brittle which we all looked forward to each year. It's not surprising that these kinds of gifts are so much more appreciated than something you picked up at the mall. And this year they have a special significance I think. Not only because we're all in this "economic crisis" together, but because perhaps this downturn will make us focus more on inventive things we can do ourselves--even if they take a little more time and effort. This year the one new thing I made that I'm really, really proud of is something I hope will inspire all of my friends and family to try their hand at making homemade gifts: Nocino. In addition to the baking which is something I do every year, this year I wanted to try making one of my favorite things that friends in Italy give me-- homemade walnut liquer. In Italy it's a common "amaro"--an after-dinner drink--and it's almost always homemade. It's dark black and tastes like nuts and spices. It's the perfect winter warmer. I gathered the walnuts from a neighbor with a huge walnut tree this fall. He didn't have a use for them so I went over there and took as many as I could carry. I followed a recipe I found on-line and then put it up to age for 40 days down in the crawl space of our house. Every once and while we would go down there and shake the bottles to mix up the alcohol, sugar and spices, each time more eager than the last to take a little sip. But we waited patiently. And when it was time to strain it and pour it into little bottles, each with its own gift tag, I have to say it made me proud to write "homemade walnut liquer" just for you! Begin by quartering the nuts with a heavy bladed knife or cleaver. Wear gloves and do this outside on some newspaper as the walnut juice will stain. Put the nuts and the remaining ingredients in a jar, cover it tightly, and put it in a cool, dark place for 40 days, shaking it every two or three days. Once the nuts have steeped, taste the nocino. If it's too strong, dilute it with some spring water. Then line a funnel with filter paper and strain the nocino into bottles of your choosing. When giving away, tell people they can age it for 6 more months in a cool, dark place or enjoy immediately. (from italianfood.about.com, based on the recipe from Pellegrino Artusi's The Art of Eating Well). I have been busy in the kitchen lately. It has been a regular Santa's bakeshop around here. I decided at least a month ago that all of my gifts this year will be homemade. So if you're reading this and you are expecting a gift from me, this is a SPOILER: your gift will be so delicious. That's because I had a marathon baking day with my good friend and stellar baker, Betsy. She roped me into baking for a neighborhood artisan market last weekend where all of our cool, hip neighbors sold their artistic wares in a new vacant building space in East Nashville. It was a very fun community event and I was glad to be a part of it. Not only did I hawk a few baked goods, but I met many nice people and was reminded of why I love this 'hood so much. Betsy and I made s'mores in the shape of little houses with homemade graham crackers, homemade marshmallows and chocolate. She made the most beautiful linzer tortes with a X-mas tree on each piece. We made a lot of yummy things, including two kinds of biscotti: almond dipped in chocolate and chocolate-orange-pistachio. We made mini cranberry walnut loaves and maple-glazed pumpkin spice loaves (the best-seller of the day), and our baker friends Lisa and Tom joined in the fun and made cheese straws, chocloate cookie crisps, sugar cookies, walnut fudge and apricot-pecan bread. Our table was overflowing with homemade goodness. You should have been there. With what I have leftover, I am giving all kinds of nice presents to friends in the coming days. It's the perfect year for making homemade gifts, really. Not just because we're all broke, but because it recalls a time when life was simpler and giving the gift of something made with love in your home kitchen was greatly appreciated. I hope this year is no exception. I was moved by the words of Jeff Poppen, the Barefoot farmer in his last missive of the growing season to the CSA supporters. I share part of it here along with a few examples of how we've loved his produce over the last 8 months as a way of saying thanks. "You get something besides food from this farm, and we get something besides money. I’m reluctant to name it, because it might be love, and love is scary. It makes me woozy, dizzy, so happy and so sad. 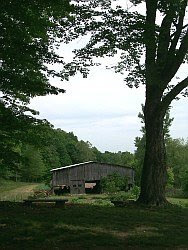 When you think of us, we feel it here at the farm. And you can feel our care when we are planting a crop before a rain, or harvesting an acre of potatoes. We are connected, and that creates happiness. As the last delivery pulls into town, the sadness of our winter separation dawns on us. We will miss you, but it’s easy to transcend the emotions. We’ll continue to draw on your thoughts and support to get the soil ready for another great year to come." It's our last week and our last bushel of beautiful produce (like the above roots) from the Long Hungry Creek Farm. We will do it again next year. The farmers have become our friends and we respect what they do more than ever. We've made good use of our farm share and feel fortunate that we were able to use most if not all of what they gave us in some new and interesting ways. I still have butternuts that need to get used. And strange cabbages are crowding my vegetable drawer. There's a radish that is scary long and bitter but tastes great with some sweet cream butter on bread with salt. The CSA experience has definitely made me a more creative cook. I am no longer a slave to the same lineup of veggies I have always used. I can whip up a turnip gratin, or a butternut squash risotto and it will taste amazing. And I made pumpkin bread from real organic pumpkins and sweet pickles out of baby cucumbers. We tried and loved mizuna in our salads and there is nothing better than Jeff's baby sweet potatoes, roasted with olive oil, salt and pepper and a touch of saffron. I will probably never go back to not eating seasonally. We just may have to wait until Spring to taste veggies this good again. But it'll be worth the wait. As the last week of our CSA farm share approaches the pickings are starting to get slim and the variety in our bushel is matched by the harshness of the cold winter air. So it's now that I turn to putting more meat on the table. It's not that we will be eating meat every night. No way. It's still the side dish to vegetables in our house, but I do find myself wanting to cook hearty stews and experiment with slow roasting, braising and other flavorful and comforting dishes this time of year. And yet, no matter how hard I try, the accompaniment ends up being the main event in my house. It's like the second-rate opera singer in the chorus who, because of her charm and gumption, always ends up stealing the show from the prima donna. And it was delicious. We loved it. It filled the house with the aromas of slow-roasting pork and rosemary and filled our bellies with warmth and goodness. We scooped up the beans and their broth with crusty pieces of toasted bread on Sat. night (with a great bottle of Montefalco Rosso from, of all places, central Umbria! Thanks, Woodland Wine), and finished off the leftovers for lunch on Sunday. I will make this recipe again for sure. I just may have to go to Italy to find the beans. Unless someone out there can tell me where to get good fresh cannellini beans in Nashville? Anyone? Ok, I know you'll think it's a strange transition to make from white truffles and the Four Seasons to BBQ and beer in North Carolina, but such is my life these days. It's a contradiction, I know, but I love it. After the whirlwind cross-country trip with the Italians my tastes for fine dining and wine were more than adequately satisfied: Cipriani's in NYC, Atelier de Joel Rubochon in Las Vegas, Mastro's Steakhouse in L.A., and Shanghai 1930 in San Francisco. And that's not counting the lunches in between. But I was genuinely happy to get home and was looking forward to my Thanksgiving trip with my boyfriend's family to Asheville, N.C. 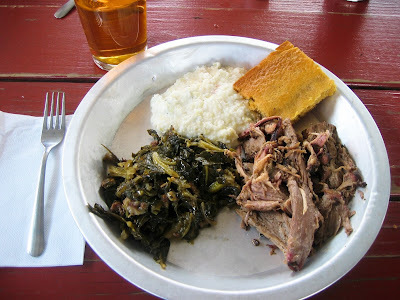 I wanted simple, Southern food and beer and that's what I am going to talk about here. 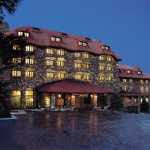 But we dined for Thanksgiving at the historic Grove Park Inn, which bears mentioning. I thought the gigantic fireplace and the building itself were more interesting than the food, but the Thanksgiving buffet satisfied all kinds of tastes and pleasures. It's just that I'm old-fashioned and nothing beats a home-cooked turkey with all the traditional trimmings. The next day, while gallery hopping and browsing in all the local crafts shops (of which Asheville has plenty) we stumbled upon a place in the River Arts district that the locals raved about called 12 Bones Smokehouse. I liked the sound of it so I headed over there without delay only to find a line out the door of about 40 people. It was lunchtime so I took a look around and decided to come back that afternooon. I dragged everyone in my party there, whether they were hungry or not, and boy was I happy I did! Turns out the place is famous --not least because on a recent trip to N. Carolina before the last debate, President-elect Barack Obama ate there and the neighborhood was still bragging about it. In fact, he overnighted at the Grove Park Inn, but ordered take-out from 12 Bones for his whole staff to be brought to the hotel. Now that's a guy who knows what's up. Forget the fancy hotel options and go straight to where the locals eat. Now I am no BBQ expert, although I've learned alot since moving to the South. I know what I like and this was definitely the best I've tasted. 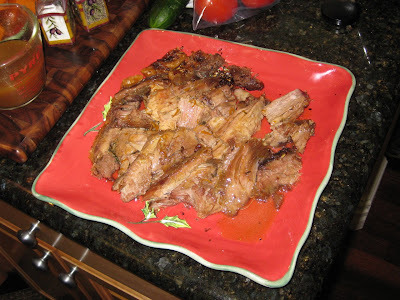 The slow-cooked pork was so moist and flavorful it didn't need any of the sauces, but they were good just the same. The jalapeno cheese grits were creamy and spicy --an improvement on the typical Southern fare. But the best thing on the plate were the collard greens. I don't know what they did to them, but they were fabulous --just a tiny bit bitter, with just the right amount of pork and the perfect soggy consistency. With the vinegar added like they do it in the South, it was a combination of flavors that was unbeatable. And even the cornbread was different. Instead of the usual dry and crumbly fare, this one was moist and didn't fall apart and offered up the slightest hint of sweetness and maybe even a spice like cinnamon perhaps. Whatever it was, it got my approval. The beers were also outstanding. 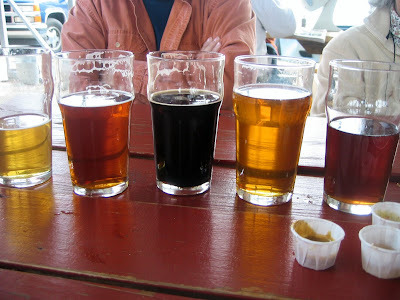 We tried 6 different local brews and all of them were tasty. In fact, I had more good, locally brewed beer that weekend than I care to remember. I only wish I had thought of bringing some home to share. 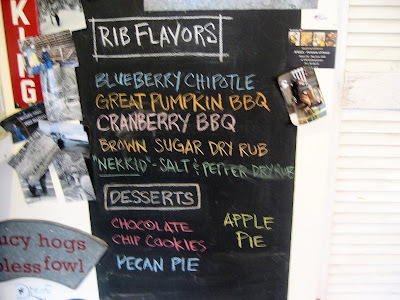 Unfortunately, I did not get to try the baby back ribs that were the claim to fame with 2-3 daily changing flavors like blueberry chipotle and pumpkin or cranberry. (??!!) That's what I imagine Barack eating --blueberry chipotle ribs or sliced beef brisket with sides of buttered grean beans and corn pudding or cucumber salad and cole slaw...and I bet he likes dessert! 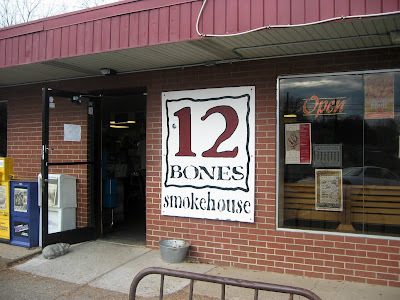 I will definitely return to Asheville and you can be sure that my first stop will be 12 Bones Smokehouse.